Jon Pertwee, actor, died yesterday aged 76. He was born on July 7, 1919. JON PERTWEE was the third actor to play the title role in Dr Who for television. He took over from Patrick Troughton in the seventh season of the series in 1970, and remained with it for five years, before cosmetically "regenerating", before the eyes of horrified children, into a new Doctor played by Tom Baker. Pertwee's five-year stint as the Doctor encompassed some radical changes to the BBC children's programme. Instead of the Tardis (an acronym for Time and Relative Dimensions in Space), Unit HQ became the Doctor's new base of operations, and a team of Unit personnel, led by Brigadier Lethbridge-Stewart, joined the Doctor's regular team of daring female companions. Despite the new family, the onus for making the programme work rested as firmly as ever on the shoulders of the Doctor. 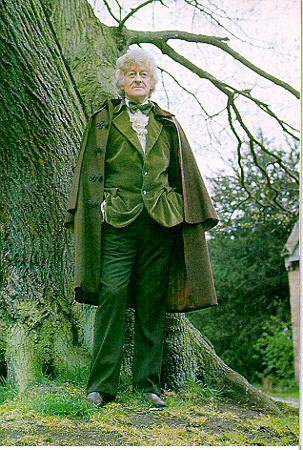 Pertwee took a risk on playing him as a camp, charismatic scientist, respendently dressed for time travel in a velvet smoking jacket, ruffled shirt and red satin lined cape. Although Pertwee was quick to acknowledge the blessing which Dr Who and later TV's Worzel Gummidge had bestowed upon his career, he had mixed feelings about being forever manacled, in the public imagination, to children's television. He had also done excellent work in radio, theatre, vaudeville, cabaret. He had appeared in 120 films and was doing an energetic one-man show in his mid-seventies. But, while he had enjoyed a comfortable, profitable career, and was rarely out of work, there was also something rather chaotic about his curriculum vitae. It lacked the sort of single-minded focus which propels less talented individuals to greater heights. John Devon Roland Pertwee was born into a family so closely linked with the stage that a career in anything but showbusiness would have been considered eccentric. Four doughty great aunts ­ the Moore sisters ­ were actresses. His father Roland was a playwright and a novelist, and had been a friend of Gerald du Maurier, the author of Trilby. Pertwee had served tea to Laurence Olivier by the time he was in his teens. But the inevitability of his career, he felt later on, may have told against him: "Because it was the family business I never had to struggle to join it ­ I took it for granted, which is maybe why I've never taken it seriously enough." Pertwee was educated at Sherborne and then joined RADA. During the 1930s he went through the traditional learning school of repertory theatre, interspersed with odd jobs. On commercial radio, he began to make a name for himself with his chameleon- like ability to hop from one accent and dialect to another at great speed. During the war he served in the RNVR as an officer. He was appointed to HMS Hood from which he was extremely fortunate to be returned to shore, along with 16 others, shortly before that vessel was sunk by the Bismarck ­ going down in nine seconds. He ended his service career with the broadcasting section of the Navy, where he met Eric Barker. This led, after the war, to work on Barker's Waterlogged Spa and for The Navy Lark, where Pertwee played an enormous range of characters: Commander High-Price, Robin Fly, the Bugler from Plymouth Barracks, and Dai, the Welsh storyteller, among others. He played Mr Burp for Jimmy Jewel and Ben Warriss in Up the Pole. He enjoyed the camaraderie of working in the sort of small group which radio entailed. Those in the business were beginning to take notice of Pertwee, although they were not quite sure what to make of him at first ­ "potentially nearly as versatile as Jack Train" was one assessment in 1948. Someone else noted that he looked rather too like Danny Kaye for his own good, and that this may be why he hid himself "under a mass of crêpe hair". The general consensus was that he should concentrate on one form of acting: radio, variety or film, but Pertwee gaily ignored this. He began his film career in the late 1930s, and continued through the 1950s juggling television, radio work and summer shows. He took small parts in a host of Carry On films. In the early 1960s he had a particular success at the Strand Theatre in A Funny thing Happened on the Way to the Forum, playing with Frankie Howerd. He had landed a part in the show almost by accident. When auditions were announced, Pertwee was touring in a revue called See You Inside (an unfortunate title as very few people were ever seen inside the theatre during a performance). Having made an excuse about a dental appointment, he raced to the auditions in London, only to find that half the cast of See You Inside had had the same idea, and were already there when he arrived. In 1969 came the decisive moment when Pertwee was asked to take over as Dr Who. The longest-running children's drama had begun life in November 1963. The first episode was about a young girl whose curiously first-hand understanding of history astonished her teachers at school. They follow her into what appears to be an ordinary police telephone box (in fact the Tardis), and there meet her eccentric grandfather, Dr Who, who is in fact a time traveller. Dr Who was played first by William Hartnell, and then by Patrick Troughton, both with great success. However, in a survey of Doctors past and present over the past three decades, the Pertwee and Tom Baker interpretations are considered by many to be the finest. Pertwee's five seasons with the show introduced such new story lines and characters as the Master ­ a renegade Time Lord, the dramatic equivalent of Bond's Blofeld, who remained with the show after Pertwee left it. Other strong episodes included encounters with Solonian mutants, and, of course, the Daleks. Pertwee left the show at the end of the eleventh season, keen to get back to the excitement of live performance. He spent a few years in the West End with musicals like Irene. Then in 1979 he returned to the small screen, this time with Southern Television, in a Sunday evening children's programme written by Keith Waterhouse and Willis Hall. Worzel Gummidge, about a tender-hearted, walking, talking scarecrow, had started life as a children's book in the 1930s and then enjoyed a great success on Children's Hour on the radio. Pertwee played the title role in four successive television seasons, and won impressive viewing figures from an army of five-year-olds. However, while the show certainly consolidated his appeal with very young children, it could never hope to have the same sort of mass appeal as his role as Dr Who. In the end, Pertwee was philosophical about having becoming a national institution as the Doctor. He recently did a radio series for the BBC, The Ghost in Space, for which he once more brushed down his old black cape, and he spoke to many conventions of fans. For the last two years he toured Britain with his one-man show, Who is Jon Pertwee?, a biographical overview of his career which drew heavily on the experience of playing the Doctor. He was determined to carry on working and appeared as fit and enthusiastic as ever, even under the rigours of the Christmas pantomime season. There was no illness, and his death came unexpectedly, while he was on holiday in America.